Marking the National Day Of Prayer, evangelist Franklin Graham led in prayer this morning at the Pentagon. Not inside the Pentagon, mind you, but outside, where he led a handful of other Christians in silent prayer. The recent controversy about Franklin Graham is a sign of things to come. The prominent evangelist, son of Billy Graham, is known for his plain-spoken Christian testimony. He is also an internationally known figure as founder and head of Samaritan’s Purse, a highly respected Christian relief agency. He had been scheduled to speak at the Pentagon today for an official National Day of Prayer event. But, just two weeks ago, he was disinvited by Pentagon officials after complaints were made about his statements concerning Islam. Someone’s mind clearly changed between 2003 and 2010 — and that someone wasn’t Franklin Graham. News reports about the disinvitation this year indicate that the Army acted after criticism came from activist Mikey Weinstein, who opposes virtually all Christian influence in the armed forces. Graham, who also serves as this year’s honorary chairman of the National Day of Prayer Task Force, complained that his disinvitation represents intolerance toward biblical Christianity and a violation of his religious liberty. 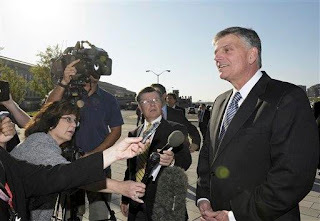 In interview after interview, Franklin Graham has repeated his message that salvation is found in Jesus Christ alone, that the gospel of Christ is the only message that offers salvation, and that any belief system that leads persons away from that gospel is false and empty. He has also pressed his case when asked about Islam, arguing that Islam is prone to violence and mistreats women — arguments he says are validated by his experience with relief efforts led by Samaritan’s Purse. Clearly, for Christians the most important issue here is the exclusivity of the gospel of Jesus Christ. Faced with mounting criticism from secularist and Islamic organizations, the Department of the Army and the Pentagon faced a hard public test — and they failed that test miserably. They caved into activist pressure and withdrew the invitation. Even on its face, this was not a smart move. An estimated 80 percent of those enlisted in the U.S. armed forces identify as Christians. Put bluntly, citizens with conservative Christian commitments are far more likely to support and enlist in the armed forces than liberal secularists — and recruiters know that fact very well. Where would you rather serve as an Army recruiter — Cambridge, Massachusetts or College Station, Texas? The Army sent a clear message by disinviting Franklin Graham, and that message will be both heard and remembered. Adding insult to injury, the spokesman for the Pentagon made a direct reference to Franklin Graham’s statements about Islam, calling them “not appropriate.” What is clearly “not appropriate” is for a Pentagon spokesperson to render a theological judgment about the statements of Franklin Graham. When the controversy about Franklin Graham’s statements hit the first round of public controversy, I was asked to appear on Fox News’ The O’Reilly Factor to discuss the controversy. I did, pointing out that what Franklin Graham said about the exclusivity of the gospel is nothing other than classic Christianity. Evangelical Christians in the United States had better see a big challenge staring us in the face. Franklin Graham was disinvited by the Pentagon for making statements that are required by faithfulness to the gospel of Christ. As reports make clear, it is not just his statements about Islam being prone to violence that cause offense, it is his statements that Islam is wicked because it does not lead to salvation in Christ that cause the greatest offense. The Pentagon failed its test, but many more tests will follow. Faithful witness to Christ requires an honest statement about what any false system of belief represents — a form of idolatry and false teaching that leads to eternal damnation. There may be more and less offensive ways of saying that, but there is no way to remove the basic offense to the current cultural mind. In reality, every evangelical preacher and every individual Christian will face this question — and probably sooner rather than later. Franklin Graham will not be the last to be tested. Who will be tested next?